Our graduates are doing amazing things. From developing food and wellness products to opening private practices, we love sharing stories from successful students and grads that are working to change the world for the better. 2009 graduate Susan Roberts, of New York City, is a special case. She’s making strides in an area where the importance of good nutrition is not explored or emphasized enough. Susan applied what she learned in the Health Coach Training Program to her work as an occupational therapist. She already addressed other areas of wellness with her clients, such as the importance of primary food, but for this advanced scholar, author and lecturer, her nutrition education provided the final piece of the puzzle in her practice: eating well. This interview with Susan highlights her thoughts on where the “mealtime” process went wrong, and her essential work to restore a healthy, positive diet for even the pickiest kids out there. What type of work have you done since completing in Integrative Nutrition's program, and what are you up to now? I began touring the United States teaching other professionals (primarily occupational therapists, speech therapists and registered dietitians) the role of primary foods and real foods to helping children eat a wider variety of healthy foods and the importance of having "happy" mealtimes. My presentation is called "Mealtime Success for Kids on the Spectrum: Holistic Nutrition for Picky Eaters." I educate 200 to 300 professionals every month. 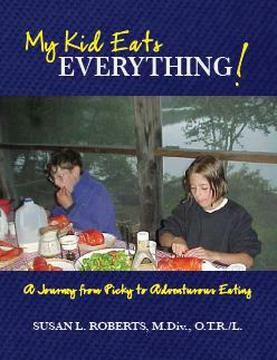 I also wrote a book on the same subject for families, My Kid Eats Everything: a Journey from Picky to Adventurous Eating. I was relatively new to New York and working a temporary job – looking for a way to do what I do best (help children find happiness by learning new skills). I was working with several classrooms of severely involved special education students at a NYC Dept. of Education High School in Queens and I found the brochure on a table after the regular education students had left the cafeteria. I brought it home to show to my partner who was also searching for more meaningful work. She thoroughly explored the program and then enrolled. I followed Adelle Davis’ writing on nutrition in the 1970’s and come from a family of great cooks so the nutrition angle seemed interesting to me. I realized I would be too jealous of her opportunity to hear all the wonderful speakers if I didn’t also enroll – so I did. How did you incorporate your newfound nutrition knowledge into your existing practice? When I started my career as an occupational therapist (30 years ago) if a child could get a food to her mouth, chew it, and swallow it, I felt my job was done. Now I make it clear in my lectures that getting children to feel comfortable eating healthy foods is critical to mealtime treatments. I really got interested in the whole traditional foods movement after Sally Fallon’s lecture. I bought her book and began experimenting with various recipes. A classmate gave me a copy of Sandor Katz’ Wild Fermentation and I was really off and running. I work with a lot of children who do better on diets that include fermented foods and I’m an activist, so I liked the double meaning of fermentation and used it as my newsletter title. Each newsletter gives my lecture schedule, a recipe, and a book review. Why is it so important for occupational therapists, registered dietitians and other professionals to learn about primary foods and healthy diets for children? As an occupational therapist, I was very familiar with the primary foods – we call them “domains of self-care, work, play and spirituality.” When it comes to children I believe that the primary foods are: outdoor play, games (social play), imaginary play, and all the things adults want them to do. Most adults, including professionals, focus entirely on what we want children to do – dress themselves, eat healthy foods, and get good grades. Children are literally starving for PLAY, the primary occupation of childhood. Until we feed children’s needs for play we cannot change the way they eat. How would you describe the overall process of transforming a picky eater's diet into a nutritious, holistic diet? I believe that everyone can help their children learn to enjoy nutritious and holistic diets. Easy? Not so much. Simple? Yes. Eating is something we learn by watching others eat. Families (and classrooms) must eat together and model how to explore and enjoy food. I approach “mealtimes” as a dysfunctional “occupation” in our current culture. We have lost touch with where our food comes from. We have no idea how to prepare it and we eat from an increasingly narrower range of foods, which adversely affects our health. We eat alone and on the run. We have been told that it is wrong to “live to eat” that instead we should “eat to live.” Many people do not trust their own relationship to food, and mistakenly turn to “experts.” Understanding this basically broken “occupation” is the first step to transforming everyone’s diet – especially picky eaters. We start by restoring the basic mealtime roles. Adults provide food, choose when to provide it and give children clearguidelines about how to prepare and eat food. Children decide what to put into their mouth and how much. In families with picky eaters, usually the child dictates what will be served (only what the child requests), when it will be served (whenever the child wants), and how to behave (tantrums when they don’t get what they want.) Adults take over the role of what and how much they expect their children to eat for specified and unspecified rewards and punishments. “Take a bite and …” Restoring basic roles becomes exceedingly difficult because most parents worry about what their kids currently eat and try desperately to control that. Once we give children control over their own bodies and mouths, we take small steps from the foods they like to healthier foods. We only change one small detail at a time (different brands, colors, textures, tastes) and we give children tools to explore foods without having to put the “strange” food into their mouth. Repetition makes foods friendlier. Eventually the child feels comfortable enough to “taste” a food, but this is always the last step, in a process that honors the child’s control over his/her own body at every point along the way. What are some common roadblocks that a picky eater must overcome, particularly among children with autism and other disabilities? Most of the “picky eaters” who need professional help have medical conditions that make food exploration very scary. These kids have had multiple oral procedures such as nasogastric tubes and surgery to insert feeding tubes. They have serious sensory issues that make them prefer starvation to deviating from a preferred food. They have GI responses to foods and food sensitivities that also make starvation a choice they make. Many can’t talk and so as professionals we play “detective” to figure out why they won’t eat. Some of them have no proteins at all in their list of preferred foods. This is why many parents and other professionals resort to “force” feeding techniques. Frankly, I always breathe a sigh of relief if they eat chicken nuggets or pizza – at least that will buy me time to teach them to enjoy some healthier options. The good news is that even these kids do better when we honor their knowledge of their own bodies and what they choose to put in them. Can you recall any rewarding moments you’ve had after working with children in these situations having seen a transformation in their eating habits? I always like it when children smile and realize that we can actually have fun with food – even if it’s finger painting with chocolate pudding. I love when parents thank me for giving them a break from fighting about what to eat at mealtimes and then in the next breath tell me their child has tried something new. I had a mom of an infant born with a small jaw tell me he could only eat a bite or two of yogurt at a time before gagging so she had to feed him all day long. I asked her to try taking a two-hour break between “mealtimes” and she did it even though it scared her at first. Her child began eating more than a few bites at mealtimes and she cried the first time she threw away an empty carton of yogurt several weeks later. When working with a picky eater, do you ever discover food allergies or issues that were previously unrecognized? How might this affect the mealtime success? Is there a strong need for Health Coaches in your field? YES! Families of typical children with picky eaters have no idea where to start. Families who have children with special needs are terrified as well as lost about what to do. Force-feeding is RAMPANT in this community and all it does is get children to hate mealtimes and hate eating. To survive, children learn to "numb" out about eating and food. Now shall we talk about adult feeding disorders and where these start...?